The “Insert” menu is where you can find special characters and symbols, as well as a variety of options to insert into your text. “Page Break” creates a break which will start a new page. A page break can also be inserted with the shortcut + (Win) or + (Mac). “Column Break” is similar to a page break, but is used for columns. If your page has more than one column, inserting a column break will create a break in the column where you cursor is located and start any text after that on the following page. If your text only has one column (= the main text area), inserting a column break will be exactly the same as inserting a page break. 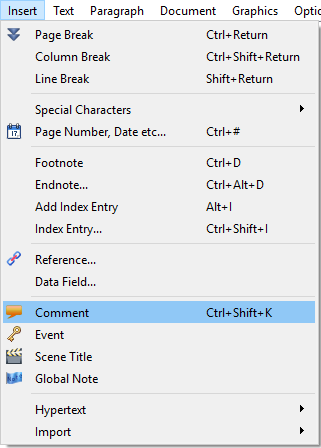 The shortcut keys for a column break are + (Win) or + (Mac). “Line Break” will insert a “soft return.” Unlike a “hard return,” which can be inserted by hitting the Return key and which starts a whole new paragraph, a soft return will bring the following text onto the next line, without starting a new paragraph. … the text can continue on a new line without inserting a new bullet. “Special Characters” → “Soft Hyphen” will insert an invisible syllable break in your word. 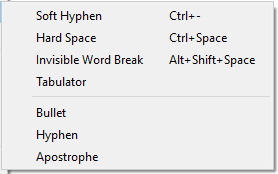 Soft hyphens will take priority over the automatic syllable breaks when you justify your text. Even when your word fits on a line completely, the soft hyphen will remain in the word, but will be invisible. If your text shifts and the word now lands at the end of a line, the soft hyphen will tell Papyrus where you would like it to be split. “Special Characters” → “Hard Space” will insert a space belonging to the word; this space will remain intact even when selecting the word with your mouse. It will also not be separated from the word or changed in size when using justified spacing. “Special Characters” → “Invisible Word Break” is used for certain languages that don’t use spaces (Thai, for example). This type of word break will insert a space, but one with a width of zero. This tells Papyrus where to make a line break and allows you to more easily select one word at a time. The invisible word break will appear in your text as a blue, vertical line. “Special Characters” → “Bullet” lets you create a bulleted list. Bulleted lists can also be made with the style template “Bullets,” which can be found in the toolbar by the icon . A single bullet cannot be entered with a keystroke, which is why we have added it to the “Special Characters” menu. “Special Characters” → “Dash” is used to set off parts of a sentence. The dash (–) is not to be confused with the hyphen (-), which has its own key on the keyboard. Hyphens are used to separate syllables, for example when using justified spacing, but not–as in this example–to separate parts of a sentence. A well-trained eye can spot the difference, so it is best to use the dash (Unicode U+2013) when appropriate. »Special Characters« → »Apostrophe«: Papyrus Author has a special automatism to always create the appropriate quotes (see “Preferences” → “User Interface” → “Automatic Quotes”). This menu call is for inserting just a normal apostrophe into your text. The next option in the menu “Insert” will open the dialog that contains the placeholders for “Date, Page Number, etc.” (“etc.” here meaning various forms of the date as well as the document name). “Endnote…” will create an endnote, which is used in addition to footnotes; the two operate independently. The content of your endnotes is determined by a database which you have assigned to your document. Under “Reference…” you can create a reference to another spot in your document. “Data Field…” will open a dialog, in which you can create the field names to be used by data in a Papyrus Database for a report template or a form letter. “Comment,” “Event,” and “Scene Title” are special types of notes that appear in the margins within their own boxes. A “Global Note” will be saved in the Navigator, but will not appear in the main text. The “HyperOffice Links” allow you to link a spot in your text to a record in a Papyrus Database (“Document” → “Indices and Directories” → “HyperOffice Links.” This record will then be opened whenever you click on the link. “HTML Tags” will open a dialog in which you can insert and edit HTML tags that Papyrus is not familiar with. The text marker dialog can be used to choose and edit the color of text markers and comment boxes. “Import” → “Text…” will open a “File Selection” window, in which you can select another text to insert into the spot where your cursor is currently placed. “Graphics” will insert a picture (in a picture format such as TIF, GIF, BMP, PNG…). How this happens will depend on the settings in the “Picture” dialog in “Preferences.” You can either choose to store the picture in the document file or directly in the Papyrus document. How the picture will be anchored and how large it will be both depend on the picture settings found in the “Object Properties” dialog (under the menu “Graphics”). Further adjustments to the picture, for example to crop it, can be done in the Picture Catalog (Menu “Graphics”). “Import Table…” will import a table in the standard exchange format “CSV” (Comma Separated Value) or in the dBase Format (for table calculations such as Excel). In the dialog you will see the fields in the import file on the left and the possible columns the result will appear in. You can import into a table that already exists. The import will begin at the current row and new lines will be created at the end if necessary. Warning: Columns will not be automatically inserted. You must first check that there are enough columns in the current table. If you import a table while your cursor is not placed in a table, a table with the necessary rows and columns will be created. “Quick Address” imports a predefined report of the address database of your choice. Make sure that your Papyrus address database has such a predefined report.